Stunning and raw Clear Herkimer Diamond Ring are hand forged in SOLID 14k gold . Solder with 14kt Gold to the prong setting. This ring with a perfect Herkimer Diamond in a prong setting. Herkimer diamonds are unique quartz crystal. This diamond are most popular of the called diamonds crystals. • This ring is hand cut, fired, shaped, hammered and polished! This mineral owes its name to Herkimer County, New York, USA, the principal place where it is found. The small, double-terminated crystals are short and stubby, formed in a hard rock matrix giving them their strength. They may be exceptionally clear and colorless, or contain rainbow inclusions, air bubbles, or black carbon deposits. Herkimer Diamonds are the most powerful of all Quartz crystals. Being doubly terminated, they have the ability to not only transmit their own energies, but to receive spiritual energy and to amplify and focus it intently. They are reported to be harder than all other Quartz, giving them the strength and durability to handle difficult challenges beyond the scope of other Quartz crystals. What they lack in physical size, they more than make up for in spirit energy. All items are made to order. Please check the our policies page, our time to works 3-5 business days or for the update production and delivery times please check the top on the announcement page. If you need it sooner, please send us a message on Etsy. All our work is made with PURE love in our Orlando Florida studio. When you purchase a piece from Camila Estrella Jewelry you can know that you’re getting handcrafted jewelry with organic energy in high quality materials and that’s made by Camila Estrella. While all jewelry is fragile and we are very diligent with our designs. We love our customers and will make sure you’re well taken care of. With each pieces you received a jewelry care instructions in the box. I am extremely disappointed in the quality of the ring. It was not worth what I spent at all. Love this ring! Absolutely perfect. We accept PayPal and all Credit Cards payments. As a method of secure online payment and super sure. You do not have a PayPal account to pay by credit or debit card. If you need other options, please send me a message and we can work something out. You may purchase merchandise from this Web site by using any one of the payment options listed in (link to Payment Options). Reserves the right to change its payment procedures at any time without prior notice to you. Items special/custom ordered, altered, or manufactured to your specifications, cannot be accepted for refund, credit or exchange. Please keep this in mind when placing your order. If your chain has been ordered too short, please purchase an extender, if your chain is too long you may send back to be shortened. There is a $5up for extender chain and you select the material + shipping. (I) Merchandise full returned within 24hrs of receiving your pay and by notifying. For change any items or purchase send with original packaging, and include a "NOTE" for the reason for your return or exchange, and any items returned without previous approval or do not meet our standards could be denied or subject to a 25% restocking fee. (II) We cannot accept returns that have been WORN, USED, ALTERED OR DAMAGED. (III) We reserve the right to refuse the return of any merchandise that does not meet the above return requirements according to our sole discretion. (IV) We carry a 30 day warranty on all items, after that if there is a problem, you will need to pay for repairs or replacement. Please contact us at contact@camilaestrella.com for pricing. (V) We will not assume responsibility for reimbursement or compensation in the event return packages are lost, stolen, or mishandled. (VI) The earrings will not be able to be exchanged for Health Department. Please allow 2 weeks business day form the day we receive the shipment for us to process. >The earrings have been created by hand so no two pieces are identical. Each pair will vary in exact size, shape and stone colour. >For health and safety reasons, there is no exchanges accepted on EARRINGS. Please choose carefully. 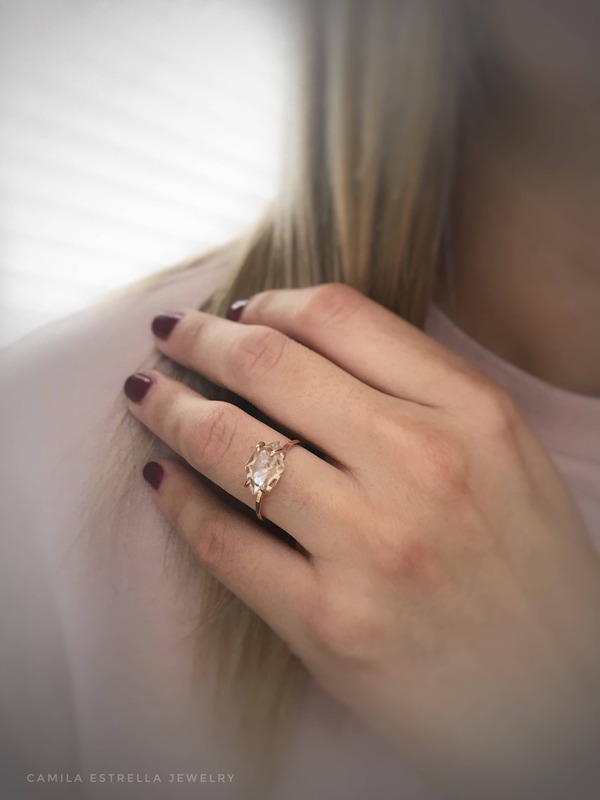 ✦✦ Camila Estrella Jewelry do NOT accept returns & refund in your BRIDAL COLLECTION, SOLID GOLD RING/NECKLACE, CUSTOMS RING, EARRINGS and PERSONALIZED JEWELRY. Thank you for understanding and supporting handmade work! Thank you for understanding and supporting handmade business!!! Your package receive in the gift box for ready to gifts. Your order include a tracking number for you to be pending the arrive of your package. If you need a specific date or gift is for a specific date by email to let us know in your checkout note, convo in contact or contact@camilaestrella.com. If you would like a different shipping method, I can adjust your shipping amount if necessary. And let us know ahead of time, which will let you know if you can make your request promptly. We ship to your Etsy address. If you want to ship your purchase to a different address, please specify in the "note to seller" box at checkout. The contents of this web-site including: all images, text, graphics, history and logo are the property of Camila Estrella and are protected by copyright laws. The reproduction, distribution, display, copy & paste or transmission of the content of this web-site is strictly prohibited and protected by laws, unless authorised by Camila Estrella in writing. What is GOLD FILLED ? Gold filled components contain 100 times more real gold than gold plated components and are very durable and tarnish resistant. Gold filled jewelry is a beautiful and gorgeous and can be worn by people with sensitive skin without worries of any allergic reaction to the jewelry. Solid gold is of course an exquisite piece of jewelry, but gold filled is the next level and is an amazing, quality alternative to solid gold. We accept the following forms of payment for orders placed on camilaestrella.com: Paypal, American Express, Visa, MasterCard, Discover and Kmi Designs gift cards. This is secure information and cannot be accessed by anyone other than the account holder. For added security, your billing address at camilaestrella.com must exactly match the address on file at your credit card company. The processing of your order may be delayed if these addresses are different. Do you include an invoice in the package? No. Since so many of our orders are as gift, we do not include invoices in the packages. If you would like an invoice please leave us a comment in your checkout letting. Jewelry shipped in a gift box? Yes. All jewelry is shipping in individual gift boxes. Yes. Please request this prior to completing your order. Once you are in the cart page, you will see a text box next to a button that says “Apply Coupon”. Enter your code into that box and hit enter. You will see it reflected in your total. If for some reason the code did not work, please leave us a comment during checkout with the code and we will refund it back to you. What if my piece of jewelry breaks? We use only the highest quality materials and craftsmanship so if treated well your new jewelry should last you a long time. However, if your jewelry is damaged, breaks, please Contact Us for repair. This have a fee if end your warranty. Do you offer additional discounts in wholesale? Yes. We offer additional discounts on orders above $1000 or more. Please Contact Us for special coupon codes. • For ready to wear, clean jewelry gently with antibacterial soup and take off excess makeup and skin oils after each wearing. chlorinated water, can do damage for ever. the piece is delicate and as movement causes stress all moving parts. All photo we take in a zoom mode for to enlarge to show detail. All rings is made to order, if you select wrong size, we can generally resize it for you. This have a fee and shipping, vary depending on the metal and ring details. If you need this work please contact me for more information. All ring have item description, so you'll be aware of that before purchasing.